Marcel van der Linden reviews Philippe Gottraux's book on French libertarian socialist group, Socialisme ou Barbarie. 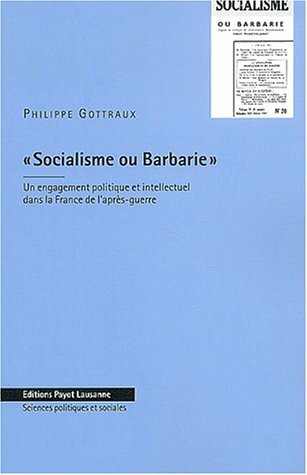 Philippe Gottraux, "Socialisme ou Barbarie." Un engagement politique et intellectuel duns la France de I'apris-guerre (Lausame: Editions Payot Lausame, 1997). The French revolutionary group Socialisme ou Barbarie (1949- 1965/67), which I have written about in this journal (Vol. 5, No. l), is a subject of growing interest, as apparent from recent publications about the organization itself and a few of its members. In addition to demonstrating this fascination once again, Philippe Gottraux's book represents the trend's peak for the time being. This study is the revision of the doctoral thesis defended by the author at the University of Lausame in 1995. Gottraux has conducted an impressive investigation. He has traced and interviewed about forty former members (whom he refers to as "socio-barbarians") and convinced a few of them to show him internal bulletins, minutes from meetings and other documents that were confidential at the time. I especially appreciate the way Gottraux relates the history of the group as a whole. All too often, the impression conveyed is that Socialisme ou Barbarie (SouB) had only one important member (Cornelius Castoriadis). The others are relegated to the role of "followers." Gottraux, however, urges consideration of the entire group. In an appendix he lists forty-four members, their pseudonyms, social and educational backgrounds and careers. Here and in the rest of the book, readers learn once again what a wonderful convergence of intellect SouB was. In addition to Yvon Bourdet, Jacques Gautrat (Daniel MothC), Claude Lefort, Jean-Fran~ois Lyotard and Pierre Souyri, Serge Bricianer, Guy Debord, GCrard Genette, Jean Laplanche, Beno Sternberg (Benno Sarel) and Henri Simon were members of the organization for varying lengths of time. Gottraux's study comprises two parts. In the first, shorter part (17-167), he provides a chronological account of SouB from the first skirmishes in the Fourth International until 11 May 1967, when the ten remaining members voted six to four to disband the organization definitively - about two years after the journal had been discontinued. This narrative section contains little about the political-theoretical discussions; the focus is on the organization's fate, although the author is clearly aware that nobody can possibly understand the situation without some knowledge of the history of ideas. I will not summarize this first section, since the essence appears in my previous essay (albeit with a far smaller empirical basis). In the second and more extensive part of his book (169-366), Gottraux uses his narrative history as material for a historical sociology of revolutionary vanguards. His main interest concerns the reasons why SouB was disbanded, based on the idea that an organization's end reveals much about its origins: apparently the motives that promote an initiative in the beginning somehow cease to be effective later on. Gottraux elaborates on this idea by emphasizing that militants have lives outside the revolutionary organization as employees, lovers etc. Active membership is possible only if such political activity is somewhat compatible with other pursuits - although some tension appears inevitable. "The agents are thus involved in other fields or social environments and made, whether they like it or not, to submit at least in part to other logics." (182) The central issue is: under which conditions will the "field" of radical politics remain dominant, and when will other "fields" (professional career, standing in the intellectual community etc.) gain the upper hand? This question is exceptionally relevant and may be crystallized in several ways. Ideally, it might be cause for a complete social and cultural history. It is therefore unfortunate that Gottraux curtails his very broad initial question to a relatively more basic issue, namely a competitive struggle between "the field of radical politics" and "the intellectual field." The basic idea inspired by Pierre Bourdieu's sociology is that the militants determined their position with respect to two entirely different social-cultural environments: that of the leftist political organizations and that of the intellectuals. While this position is intrinsically interesting, it leads all other aspects (e.g. family life) to be overlooked. The members of the intelligentsia are thus covered far more extensively than the workers, office clerks and occasional housewives, whose position with respect to the "intellectual field" was presumably far less significant. Nonetheless, Gottraux shares a wealth of useful information and a few surprizing insights within the curtailed scope of his question. He provides a detailed description of the relationship between SouB and the Trotskyist movements (the "Lambertists," the "Pablists" and Voix Ouvrikre), the Situationist International, the anarchist groups, dissident social democrats and the French Communist Party. Gottraux also deals extensively with relations with groups abroad, such as the Dutch Council Communists (Anton Pannekoek and others), the American Johnson-Forest Tendency (C.L.R. James, Raya Dunayevskaya, Grace C. Lee), Italian Bordigist dissidents (Danilo Montaldi and others) and the British Solidarity group. In analyzing the relations with the intellectual field, Gottraux concentrates on periodicals. He deals extensively with Les Temps Modernes, Jean-Paul Sartre's journal that was "dominant" (256) among the French leftist intelligentsia. Claude Lefort wrote for this journal for several years, as did Beno Sternberg. Sartre's embrace of Stalinism in the early 1950s, however, disrupted this collaboration. New areas of involvement included contacts with Arguments, a journal for left-wing "searchers" that was published from 1956 to 1962 and had fairly prominent intellectuals among its contributors such as Kostas Axelos, Roland Barthes and Edgar Morin. Relationships with more peripheral periodicals, like Les Lettres Nouvelles (of Maurice Nadeau), Le Contrat Social (of Boris Souvarine) and the Tribune Marxiste, are depicted as well, as are those with the major weeklies France-Observateur and L'Express. Gottraux also provides information about the changes in circulation of Socialisme ou Barbarie indicating that the circle of interested individuals was relatively small. Les Temps Modernes always sold at least 8,500 copies, and Arguments had about 2,000 subscribers and sold up to 3,000 additional copies. In its heyday Socialisme ou Barbarie's paid circulation peaked at 1,000. After describing the relations with the two "fields," Gottraux returns to his initial question: why was SouB disbanded? Gottraux uses his interviews with former members to reveal that different considerations motivated those resigning from the organization over the years. The reasons ranged from increasing political differences of opinion through lack of time to boredom during meetings. Gottraux describes them collectively as the "change of equilibrium" that shifted the balance from positive to negative incentives for individual militants to render membership less advantageous. (184) This explanation of the group's end is less than persuasive because of its consistent emphasis on individual balances. Gottraux also mentions a second, more important factor, namely the group dynamics within SouB. Over time, many intellectuals who had differences of opinion with Castoriadis resigned. Lefort left in 1958, Lyotard, Souyri and VCga in 1963, while Guy Debord was a member only briefly in 1960-61. By the time Castoriadis proposed to disband the group, he was so influential that serious opposition seemed out of the question. Thus, a political group of which the ideas would have tied in perfectly with the uprising in May 1968 ceased to exist a year before the event took place. It was disbanded despite the contemporaneous turmoil within the student environment and the rise of myriad radical organizations (Trotskyist, Maoist, anarchist) from 1965-66 onward. Gottraux is unable to offer a conclusive explanation for this paradox and does not attempt to do so either. Nevertheless, his book makes it far easier to accept. Finally, Gottraw's study reveals implicitly a few factual inaccuracies or shortcomings in my previous essay for Left History - deficiencies attributable to my virtually exclusive reliance on the magazine and other printed sources, and the fact that Castoriadis, whose opinion I asked, was no longer able to reply because of his illness. The most serious mistake I wish to rectify is that in the late 1950s Castoriadis no longer maintained contact with Raya Dunayevskaya (as I had written) but with Grace C. Lee, who had parted ways with Dunayevskaya in 1957. Castoriadis' writings from 1946-79 are available in a superb English translation: Cornelius Castoriadis. Political and Social Writings. Trans. and ed. David Ames Curtis. Vol. I (1946-1 955), Vol. I1 (1955- 1960), Vol. I11 (1961- 1979) (University of Minnesota, 1988-93). David Ames Curtis has also initiated a Castoriadis web site, which includes a wealth of bibliographical data: http://aleph.lib.ohio-state.edu/-bcase/castoriadis.